I believe LifeBook is the best course around and I would love to be able to participate! Thanks for the opportunity! I’m a happy newsletter subscriber. Shared this post on Google! I love LIfebook – it is truly inspiring. I was excited to learn gelli printing from you in this year’s course. Messy but so much FUN! I look forward to exploring another year of amazing artists and new techniques!!! Thanks for offering a spot! I really would love to win spot. I hope it will help me, find my way back to myself in art, the way art can heal, give that happy vibe… Everything I see from life book, it’s so inspiring! Happy to see you as one of the teachers again Lucy! I just love your art – you do amazing things with the Gelli plate – and I’ve really enjoyed participating in your classes for LifeBook and PYHAS this year! I would love to learn more from you in future classes, so it would be absolutely fantastic to win a spot! Thank you very much for the oppurtunity! 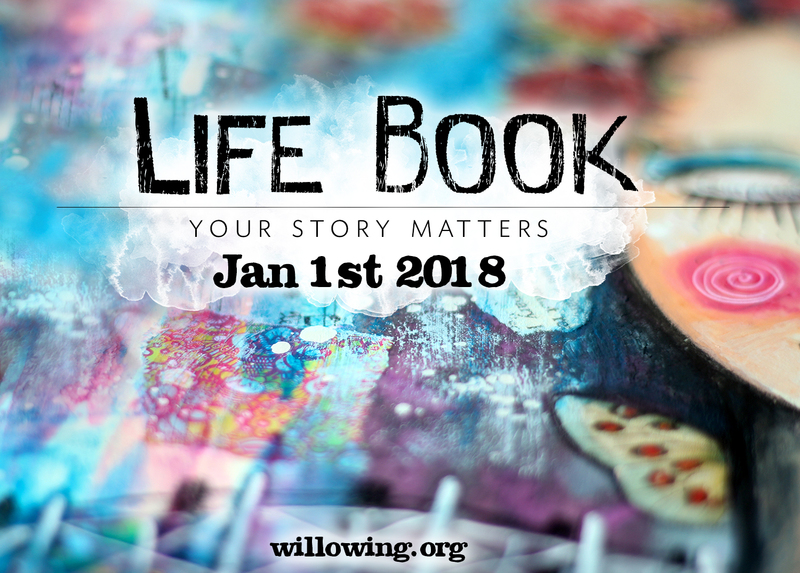 Hi am part of Ever After this year and would love to join the year long life book 2019. i have seen lots of interesting information over the year. I am finding lifebook 2018 so helpful and healing, that I must do Lifebook 2019 also. So much wonderful content for next year! Signed up. I cannot wait to learn from so many amazing artists! Such a wonderful thing to be a part of! I honestly feel like I need this course in my life. I’m trying to find myself after a lifetime of being lost. I believe this course will help me to do that and have so much fun along the way. Thank you for the chance. Hugs and peace. Signed up and want to join for all the fabulous teachers you have lined up! Signed up and would love to win so I can learn from amazing artists. Signed up looking forward to everything! One of my favorite classes. Getting better and better every year and would love to win a spot. I follow you and get your newsletter. Thank you! Shared on Facebook! I would love to win because I didn’t take the class this past year and I really miss it! It was such fun!!! Shared and newsletter signed up. I would love to have the time to explore the art and the meditations. Hi Lucy. I want to win because I love to paint faces in a healing atmosphere. I love the faces you paint and teach. I also know Tam provides a safe sanctuary for healing. I signed up for the newsletter 🙂 if love to take the class because I’m feeling disconnected from my creativity and I want to reconnect. I’m just beginning my art journey. I’m a mom to 10 kids who has an autoimmune disease and has experienced a lot of trauma over the past several years. Hoping that doing life book will help me work through some of it. I’ve seen some of the beautiful and meaningful work people have done on Lifebook. As a new artist exploring my personal journey I think I would enjoy this class. I feel that with all the challenges that have happened the past few months – this would be an opportunity to help heal my soul. Hi Lucy I would like to win a place in Lifebook as I have done it for last few years and with artists like you it has helped me to develop my art and lose “the fear” of not being good enough. I want to continue to grown but retiring this year makes funds tighter so winning a place would be fantastic as I could continue to develop my art and grow and heal as a person. Oh yes I really would LOVE a spot on lifebook 2019! Since it is now even more focused on wellbeing and holistic ways I am even more curious and attracted than ever before! I really need this in my life! I love how I get the opportunity to learn from all the different teachers on Life Book. So inspiring!! I would love to join lifebook 😘2019 because of the wonderful art and community of fellow artist. I am taking part in the summit and it is so inspiring. I’m really looking forward to your video. Lifebook would motivate me while teaching me many many things to improve my art and life. I would love to win a spot on Lifebook 2019 to learn some new art techniques. I’m a librarian, not an artist, but my patrons love arts and crafts programs at the library. I held a “bad art night” a few weeks ago and they loved it, so I’d like to learn more art techniques I can share in future library programs. I love LB!! As a single mom with chronic Lyme art is a way to escape. I would love to win a spot on LB 2019!! I would love to take Life Book 2019. It would allow me to explore my artistic abilities, learn new techniques, and gain inspiration from other creative individuals. I would love to win a spot on Life Book. I have just started returning to my art practice, which first began with Life Book 5 years ago. Due to life circumstances, I had not been “arting” for over a year until the last few weeks. A spot on Life Book feels like coming home to me. Thank you for this opportunity. Have done all the steps. 🙂 I would love to win a spot as with art I feel happy. However I’m suffering since longer from burnout syndrome and my creativity is “gone”. I feel so empty and being alone its hard to get back doing art. The Life Book Creativity & Wellbeing Summit just shows me how much I’m missing doing art again. Have signed up for 2019 and can’t wait! Watched your video on Tamara’s Summit and saw that you taught last year and found that you will be teaching again this season! YEY!!! I love Gelli printing, am very new to the technique so hope I will learn a lot more! Love lifebook since 2012. Hope to follow next year too. Thanks for the possibility to enter the giveaway. I can’t wait to see your lessons.Subscribed with love. Thank you for the opportunity to win a spot in Lifebook 2019! My main goal for Lifebook is for health and well-being. Learning beautiful art, is a bonus! Life Book is so unique! It would be so wonderful to learn from all the different artists! Thank you. Shared on my FB and signed up for the newsletter. Past year I heard so much good about Lifebook and I would love to win the free spot to improve my art and loosen up. Lifebook would be perfect I think. Thanks for this chance! I’m very impressed of your art and want to learn to loosen up my art. I’m feeling stuck now and my art isn’t improving the much I want. this course can make the difference for me. thank you for the chance to win a free spot in an amazing course . I am a new artist and I am trying a new medium. I have been following Cinnamon Cooney for a little over a year and have learned so much from her. It is time I expand my knowledge base as well as learn how to take care of myself. I am also a home health nurse and as a nurse, we put our patients and family first and often forget about ourselves. Thank you for this opportunity! I have never taken The Lifebook Class, but I am fascinated by it. I love the idea of having regular prompts to create. I am one of those that sometimes needs to have journal, pen, art supplies, etc. put in my hands. I really love my newfound crativity, I just need to have a regular pattern to follow sometimes. I would love to take this course with you and Tamara and all the other guest presenters. Hi Lucy! waves from Italy! oh well …. why would I win a spot to Life Book 2019? Now I’m slowly restarting my whole life, step by step with Big Efforts every single day! I fight the PTSD, depression and axiety it’s hard I admit it. I want to break the fear of expressing again myself . I would love to win a spot in Lifebook! I have wanted to take a class for years, but never pulled the trigger to do it. I was always worried my art wouldn’t be good enough, or that I would get overwhelmed. This year, I realized its not so much about the art for me, but about the growth and healing. I need some way to let my “happy” shine more, where I can forget about all the noise in the world right now and just create and be.